Description: Annual herb to 15 cm high, not forming a rosette, hairy. Leaves ± basal, 3–8 cm long, pinnatisect with 3–9 linear obtuse segments to 13 mm long, rarely margins entire, usually with a few scattered glandular and septate hairs near the base of the petiole. Heads 11–20 mm diam. ; peduncle filiform, 1–20 cm long; involucral bracts obovate, obtuse, margins entire or lacerate, purplish. Ray florets white; ligule 1–6 mm long. 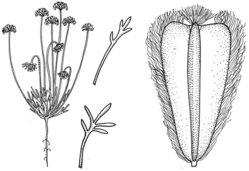 Achenes broad-cuneate, 4-angled, 3–4.5 mm long, pale brown; margins very thick, silky with glandular hairs to 2 mm long; faces smooth, with a groove to either side of the central ridge; pappus 1–1.5 mm long, of unequal bristles fused in bundles. Distribution and occurrence: Grows in a variety of habitats; south and west from Bourke district.